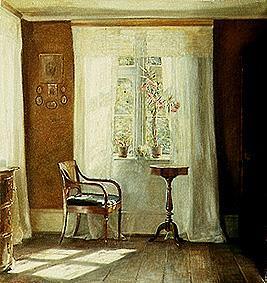 Holsoe is a very much respected artist of the Danish school. He painted landscapes, genre scenes and interiors and in this respect is very similar to Vilhelm Hammershøi. 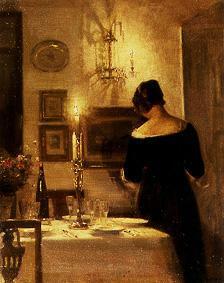 He studied at the academy in Copenhagen from 1882 to 1884 and then under Peder Severin Krøyer (1851-1909). 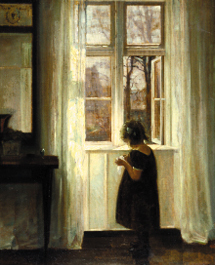 His first exhibition was at Charlottenborg, a prestigious gallery in Copenhagen and after that he received grants from the academy to travel to exhibit his works. He received accolades for his work in Paris at the Exposition Universelle and in Munich. 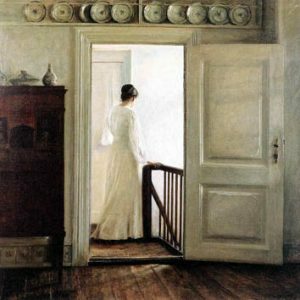 Holsoe was well known in his day and his popularity has continued to this day, resulting in high auction prices for his work.